Our menu is best enjoyed when served family-style. Though our portion sizes vary according to the dish, we generally suggest ordering one to two dishes per person, along with rice. Takeout orders can be placed online. Click on the RED button for pickup or the ORANGE button for delivery through our partnership with Caviar. Ordering food for a group? Please see our Large Group Takeout menu. Charcoal roasted, Mary’s fresh pasture raised, air-cooled chicken, stuffed with lemongrass, garlic, pepper and cilantro served with spicy/sweet/sour and tamarind dipping sauces. 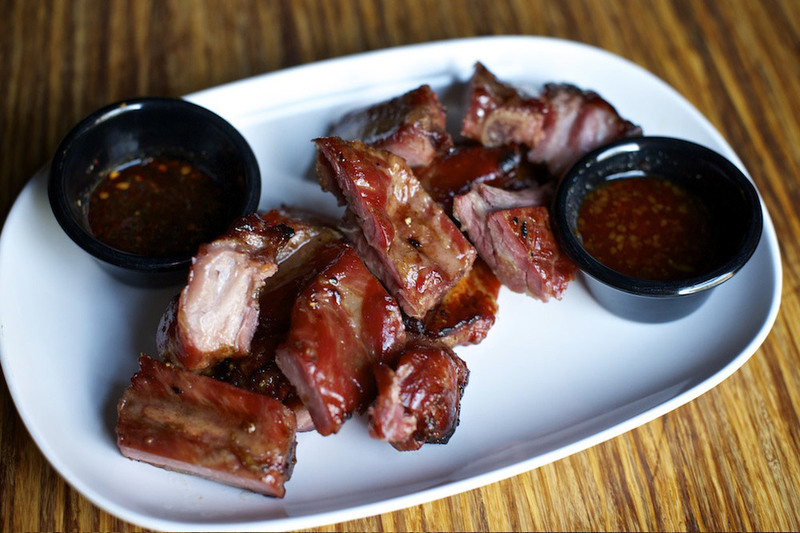 The dish that was the original inspiration for Pok Pok. Needs Sticky Rice! 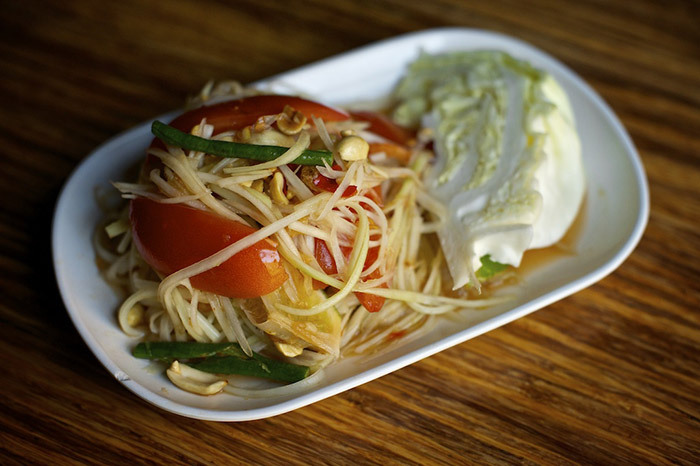 Central Thai-style spicy green papaya salad with tomatoes, long beans, Thai chili, lime juice, tamarind, fish sauce, garlic, palm sugar, dried shrimp and peanuts, made to order in the pok pok (mortar and pestle). We can make it without chiles, but it won’t be as good! Half dozen fresh whole natural chicken wings marinated in fish sauce and sugar, deep fried, tossed in caramelized Vietnamese fish sauce and garlic and served with Do Chua (pickled vegetables.) Our signature dish. Based on our daytime cook Ike’s recipe from his home in Vietnam. Crispy fried farm egg salad with lettuce, Chinese celery, carrots, onions, garlic, Thai chiles and cilantro, with a lime, fish sauce, palm sugar dressing. Aroy maak (delicious)! Spicy and sour glass noodle salad with naem (a house-made sour pork sausage), ground pork, mussels, dry shrimp, Chinese celery, pickled garlic, Thai chiles, shallots and carrot. Lime, fish sauce, garlic oil dressing. Recipe courtesy Khun Sunny Chailert. Smoky charcoal grilled long eggplant salad with spicy dressing of Thai chiles, lime, fish sauce and palm sugar, topped with boiled egg, dry shrimp, pork, prawns, shallots and crispy garlic. Classic Central Thai salad. Thai-style tuna salad, with ginger, garlic, Thai chilies, green onions, lemongrass, tomatoes and Oregon Albacore in a spicy lime and fish sauce dressing. A modern Thai dish, made better with Oregon Albacore. Spicy roasted game hen salad with long beans, tomatoes, peanuts, cilantro, Chinese celery, Thai chiles, dry shrimp, garlic, lime, palm sugar and fish sauce. Spicy Northeastern Thai chopped duck salad with lemongrass, galangal, herbs, toasted rice powder, dried chilies, lime juice and fish sauce. Served with phak sot. Tam Khanun Northern Thai smashed salad of young jackfruit, pounded in the mortar and fried with pork fat with ground pork, tomatoes, herbs and pork cracklings. Great with sticky rice! Wild caught gulf prawns baked in a clay pot over charcoal with pork belly, lao jiin, soy, ginger, cilantro root, black pepper, Chinese celery and bean thread noodles. Served with naam jiim seafood. The Chinese influence on Thai food in full evidence. Sweet cabbage stir-fried in pork fat with garlic and fish sauce. A simple, delicious and well loved Thai-Chinese staple! Carlton Farms pork loin skewers marinated in coconut milk and turmeric, grilled over charcoal and served with peanut sauce, cucumber relish and grilled bread. Yes, bread really is the normal accompaniment in Thailand. Rice vermicelli with a Northern Thai sour-savory broth of pork ribs, minced beef, black pudding, tomatoes, bean sprouts, dried dawk ngiaw and house pickled mustard greens. Served with Khao Kan Jin, a Tai Yai style dirty rice wrapped in banana leaf, topped with fried garlic oil and dried chiles. Crispy broken crepe with steamed fresh mussels, eggs, garlic chives and bean sprouts, served with Thai sriracha sauce. Thai street vendor’s specialty, popular in night markets. Half a roasted natural chicken with a small green papaya salad (papaya pok pok), sticky rice and dipping sauces.